Although Einstein made unpublished calculations on the subject in 1912, Orest Khvolson (1924) and Frantisek Link (1936) are generally credited with being the first to discuss the effect in print. However, this effect is more commonly associated with Einstein, who published an article on the subject in 1936. Gravitational lensing – intervening galaxy modifies appearance of a galaxy far behind it (video; artist's concept). This schematic image shows how light from a distant galaxy is distorted by the gravitational effects of a foreground galaxy, which acts like a lens and makes the distant source appear distorted, but magnified, forming characteristic rings of light, known as Einstein rings. An analysis of the distortion of SDP.81 caused by this effect has revealed star-forming clumps of matter. Henry Cavendish in 1784 (in an unpublished manuscript) and Johann Georg von Soldner in 1801 (published in 1804) had pointed out that Newtonian gravity predicts that starlight will bend around a massive object as had already been supposed by Isaac Newton in 1704 in his Queries No.1 in his book Opticks. The same value as Soldner's was calculated by Einstein in 1911 based on the equivalence principle alone. However, Einstein noted in 1915, in the process of completing general relativity, that his (and thus Soldner's) 1911-result is only half of the correct value. Einstein became the first to calculate the correct value for light bending. The result was considered spectacular news and made the front page of most major newspapers. It made Einstein and his theory of general relativity world-famous. When asked by his assistant what his reaction would have been if general relativity had not been confirmed by Eddington and Dyson in 1919, Einstein said "Then I would feel sorry for the dear Lord. The theory is correct anyway." In 1912, Einstein had speculated that an observer could see multiple images of a single light source, if the light were deflected around a mass. This effect would make the mass act as a kind of gravitational lens. However, as he only considered the effect of deflection around a single star, he seemed to conclude that the phenomenon was unlikely to be observed for the foreseeable future since the necessary alignments between stars and observer would be highly improbable. 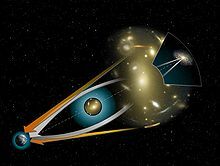 Several other physicists speculated about gravitational lensing as well, but all reached the same conclusion that it would be nearly impossible to observe. Galaxy cluster SDSS J0915+3826 helps astronomers to study star formation in galaxies. Kaiser, Squires and Broadhurst (1995), Luppino & Kaiser (1997) and Hoekstra et al. (1998) prescribed a method to invert the effects of the Point Spread Function (PSF) smearing and shearing, recovering a shear estimator uncontaminated by the systematic distortion of the PSF. This method (KSB+) is the most widely used method in weak lensing shear measurements. KSB's primary advantages are its mathematical ease and relatively simple implementation. However, KSB is based on a key assumption that the PSF is circular with an anisotropic distortion. This is a reasonable assumption for cosmic shear surveys, but the next generation of surveys (e.g. LSST) may need much better accuracy than KSB can provide. In SDSS J0952+3434, the lower arc-shaped galaxy has the characteristic shape of a galaxy that has been gravitationally lensed. ^ Drakeford, Jason; Corum, Jonathan; Overbye, Dennis (March 5, 2015). "Einstein's Telescope - video (02:32)". New York Times. Retrieved December 27, 2015. ^ Overbye, Dennis (March 5, 2015). "Astronomers Observe Supernova and Find They're Watching Reruns". New York Times. Retrieved March 5, 2015. ^ a b Tilman Sauer (2008). "Nova Geminorum 1912 and the Origin of the Idea of Gravitational Lensing". Archive for History of Exact Sciences. 62 (1): 1–22. arXiv:0704.0963. doi:10.1007/s00407-007-0008-4. ^ a b Turner, Christina (February 14, 2006). "The Early History of Gravitational Lensing" (PDF). Archived from the original (PDF) on July 25, 2008. ^ Bičák, Jiří; Ledvinka, Tomáš (2014). General Relativity, Cosmology and Astrophysics: Perspectives 100 years after Einstein's stay in Prague (illustrated ed.). Springer. pp. 49–50. ISBN 9783319063492. ^ a b c "A brief history of gravitational lensing — Einstein Online". www.einstein-online.info. Archived from the original on 2016-07-01. Retrieved 2016-06-29. ^ a b c Schneider, Peter; Ehlers, Jürgen; Falco, Emilio E. (1992). Gravitational Lenses. Springer-Verlag Berlin Heidelberg New York Press. ISBN 978-3-540-97070-5. ^ Dieter Brill, "Black Hole Horizons and How They Begin", Astronomical Review (2012); Online Article, cited Sept.2012. ^ Melia, Fulvio (2007). The Galactic Supermassive Black Hole. Princeton University Press. pp. 255–256. ISBN 978-0-691-13129-0. ^ Soldner, J. G. V. (1804). "On the deflection of a light ray from its rectilinear motion, by the attraction of a celestial body at which it nearly passes by" . Berliner Astronomisches Jahrbuch: 161–172. ^ Newton, Isaac (1998). Opticks: or, a treatise of the reflexions, refractions, inflexions and colours of light. Also two treatises of the species and magnitude of curvilinear figures. Commentary by Nicholas Humez (Octavo ed.). Palo Alto, Calif.: Octavo. ISBN 978-1-891788-04-8. (Opticks was originally published in 1704). ^ Will, C.M. (2006). "The Confrontation between General Relativity and Experiment". Living Reviews in Relativity. 9 (1): 39. arXiv:gr-qc/0510072. Bibcode:2006LRR.....9....3W. doi:10.12942/lrr-2006-3. ^ Dyson, F. W.; Eddington, A. S.; Davidson C. (1920). 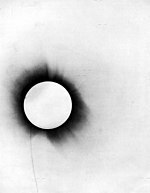 "A determination of the deflection of light by the Sun's gravitational field, from observations made at the total eclipse of 29 May 1919". Philosophical Transactions of the Royal Society. 220A (571–581): 291–333. Bibcode:1920RSPTA.220..291D. doi:10.1098/rsta.1920.0009. ^ Stanley, Matthew (2003). "'An Expedition to Heal the Wounds of War': The 1919 Eclipse and Eddington as Quaker Adventurer". Isis. 94 (1): 57–89. doi:10.1086/376099. PMID 12725104. ^ Dyson, F. W.; Eddington, A. S.; Davidson, C. (1 January 1920). "A Determination of the Deflection of Light by the Sun's Gravitational Field, from Observations Made at the Total Eclipse of May 29, 1919". Philosophical Transactions of the Royal Society A: Mathematical, Physical and Engineering Sciences. 220 (571–581): 291–333. Bibcode:1920RSPTA.220..291D. doi:10.1098/rsta.1920.0009. ^ F. Zwicky (1937). "Nebulae as Gravitational lenses" (PDF). Physical Review. 51 (4): 290. Bibcode:1937PhRv...51..290Z. doi:10.1103/PhysRev.51.290. ^ Schneider Peter; Kochanek, Christopher; Wambsganss, Joachim (2006). Gravitational Lensing: Strong, Weak and Micro. Springer Verlag Berlin Heidelberg New York Press. p. 4. ISBN 978-3-540-30309-1. ^ Walsh, D.; Carswell, R. F.; Weymann, R. J. (31 May 1979). "0957 + 561 A, B: twin quasistellar objects or gravitational lens?". Nature. 279 (5712): 381–384. Bibcode:1979Natur.279..381W. doi:10.1038/279381a0. PMID 16068158. ^ Friedman, Y.; Steiner, J. M. (2017). "Gravitational Deflection in Relativistic Newtonian Dynamics". Europhysics Letters. 117 (5): 59001. arXiv:1705.06967. Bibcode:2017EL....11759001F. doi:10.1209/0295-5075/117/59001. ^ "Helping Hubble". www.spacetelescope.org. Retrieved 29 October 2018. ^ Cassan, A.; Kubas, D.; Beaulieu, J.-P.; Dominik, M.; Horne, K.; Greenhill, J.; Wambsganss, J.; Menzies, J.; Williams, A. (2012). "One or more bound planets per Milky Way star from microlensing observations". Nature. 481 (7380): 167–169. arXiv:1202.0903. Bibcode:2012Natur.481..167C. doi:10.1038/nature10684. ^ Sci-News.com (21 Oct 2013). "Most Distant Gravitational Lens Discovered". Sci-News.com. Retrieved 22 October 2013. ^ van der Wel, A.; et al. (2013). "Discovery of a Quadruple Lens in CANDELS with a Record Lens Redshift". Astrophysical Journal Letters. 777 (1): L17. arXiv:1309.2826. Bibcode:2013ApJ...777L..17V. doi:10.1088/2041-8205/777/1/L17. ^ Wong, K.; et al. (2014). "Discovery of a Strong Lensing Galaxy Embedded in a Cluster at z = 1.62". Astrophysical Journal Letters. 789 (2): L31. arXiv:1405.3661. Bibcode:2014ApJ...789L..31W. doi:10.1088/2041-8205/789/2/L31. ^ Hanson, D.; et al. (Sep 30, 2013). "Detection of B-Mode Polarization in the Cosmic Microwave Background with Data from the South Pole Telescope". Physical Review Letters. 14. 111 (14): 141301. arXiv:1307.5830. Bibcode:2013PhRvL.111n1301H. doi:10.1103/PhysRevLett.111.141301. ^ Einstein, Albert (1936). "Lens-Like Action of a Star by the Deviation of Light in the Gravitational Field". Science. 84 (2188): 506–507. Bibcode:1936Sci....84..506E. doi:10.1126/science.84.2188.506. PMID 17769014. ^ Eshleman, Von R. (1979). "Gravitational lens of the sun: its potential for observations and communications over interstellar distances," Science, 205 (4411): 1133–1135. ^ Claudio Maccone (2009). Deep Space Flight and Communications: Exploiting the Sun as a Gravitational Lens. Springer. ISBN 9783540729433. ^ Landis, Geoffrey A., “Mission to the Gravitational Focus of the Sun: A Critical Analysis,” paper AIAA-2017-1679, AIAA Science and Technology Forum and Exposition 2017, Grapevine TX, January 9–13, 2017. Preprint at arXiv.org (accessed 24 December 2016). ^ "Galaxy cluster MACS J2129-0741 and lensed galaxy MACS2129-1". www.spacetelescope.org. Retrieved 23 June 2017. ^ Kaiser, Nick; Squires, Gordon; Broadhurst, Tom (August 1995). "A Method for Weak Lensing Observations". The Astrophysical Journal. 449: 460–475. arXiv:astro-ph/9411005. Bibcode:1995ApJ...449..460K. doi:10.1086/176071. ^ Luppino, G. A.; Kaiser, Nick (20 January 1997). "Detection of Weak Lensing by a Cluster of Galaxies at z = 0.83". The Astrophysical Journal. 475 (1): 20–28. arXiv:astro-ph/9601194. Bibcode:1997ApJ...475...20L. doi:10.1086/303508. ^ Babu, Gutti Jogesh; Feigelson, Eric D. (2007). Statistical Challenges in Modern Astronomy IV: Proceedings of a Conference Held at Pennsylvania State University, University Park, Pennsylvania, USA, 12–15 June 2006, Volume 371 (illustrated ed.). Astronomical Society of the Pacific. p. 66. ISBN 978-1-58381-240-2. ^ Plionis, Manolis; López-Cruz, O.; Hughes, D. (2008). A Pan-Chromatic View of Clusters of Galaxies and the Large-Scale Structure (illustrated ed.). Springer Science & Business Media. p. 233. ISBN 978-1-4020-6940-6. ^ Frederic Courbin, Dante Minniti, Frederic Courbin, Dante Minniti (2008). Gravitational Lensing: An Astrophysical Tool (illustrated ed.). Springer. p. 69. ISBN 978-3-540-45857-9. 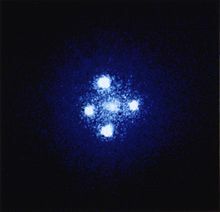 ^ "Hubble sees the brightest quasar in the early Universe". www.spacetelescope.org. Retrieved 10 January 2019. ^ "On the hunt for newborn stars". www.spacetelescope.org. Retrieved 15 October 2018. ^ "Warped and distorted". www.spacetelescope.org. Retrieved 24 September 2018. ^ "Stretched out image of distant galaxy". www.spacetelescope.org. Retrieved 16 January 2018. ^ "Cosmic snake pregnant with stars". www.spacetelescope.org. Retrieved 20 November 2017. ^ "Hubble captures gallery of ultra-bright galaxies". www.spacetelescope.org. Retrieved 8 June 2017. ^ "Detailed look at a gravitationally lensed supernova". www.spacetelescope.org. Retrieved 21 April 2017. ^ Loff, Sarah; Dunbar, Brian (February 10, 2015). "Hubble Sees A Smiling Lens". NASA. Retrieved February 10, 2015. 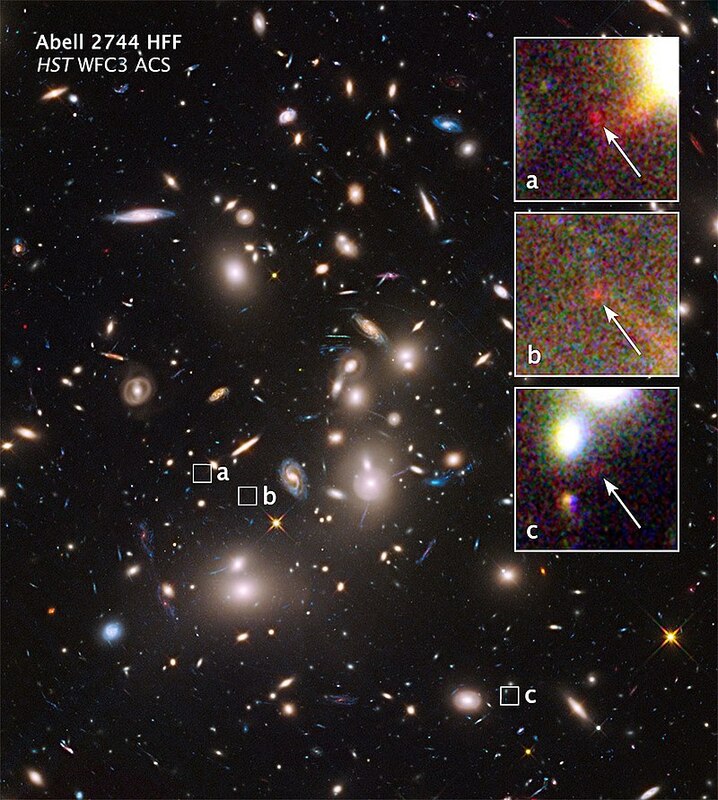 ^ "Most distant gravitational lens helps weigh galaxies". ESA/Hubble Press Release. Retrieved 18 October 2013. ^ "ALMA Rewrites History of Universe's Stellar Baby Boom". ESO. Retrieved 2 April 2013. Newbury, Pete, "Gravitational Lensing[permanent dead link]". Institute of Applied Mathematics, The University of British Columbia.